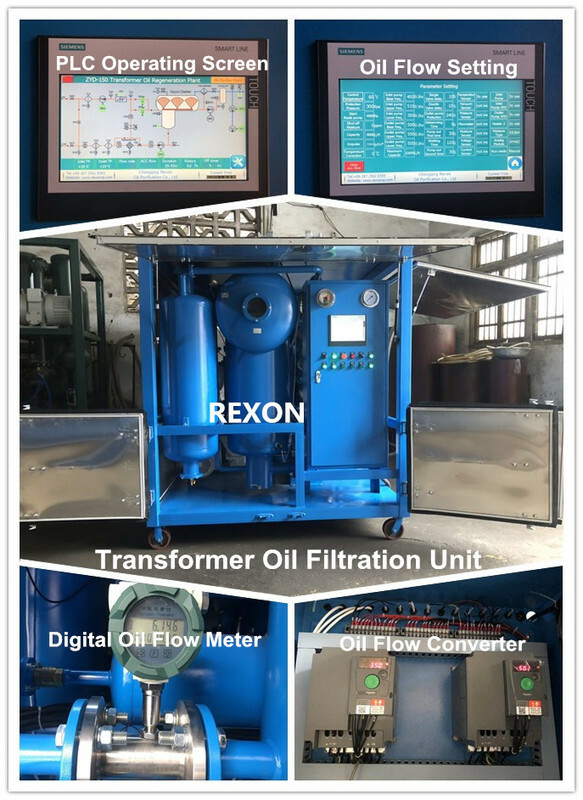 Rexon new transformer oil filtration plant is very multifunctional, you can not only use the machine to be a vacuum pump system to do transformer vacuuming, but also you can use the machine to deal with many different size transformers, the small one, and big one etc. You can change oil flow capacity easily through PLC system of our new oil filtration plant. And the operation is very easy, just touch the screen and change the oil flow data is ok. For example, if you buy a 9000LPH oil purifier machine, you can use the plant to process any oil flow capacity during 0 to 9000Liters/Hour, like 1000Liters/Hour, 3000Liters/Hour, 5000Liters/Hour, 6000Liters/Hour, 8000Liters/Hour etc. So under this situation, you can buy only one machine to maintain many different transformers with different oil capacity, and every time, the machine will work automatically with suitable oil flow to match each transformer well, and running fluently. The new oil filtration system takes oil inlet pump and oil outlet pump independently, and uses two oil flow converters to achieve this function perfectly, and with installing the oil flow meter, you can read the actual oil flow directly from the oil flow meter and PLC screen too. It’s very simple and easy to understand the machine and use the oil filtration system. Rexon team always welcome your visit and online contact for more information.